Baseball: Following last Wednesday’s 9-4 loss against Annandale, Falls Church baseball faces Washington and Lee this Monday, April 20 in a home game at 6 p.m. The team standing so far this season is 0-10. Boys Lacrosse: The boys lacrosse team advanced their first-place season standing to 5-2 with a 8-7 win against Yorktown on Tuesday. The boys take on Centreville today in an away game at 7:15 p.m. Girls Lacrosse: The Lady Jaguars lost 17-5 against Yorktown Tuesday night. They also face Centreville today at home. Soccer: Returning from spring break, the boys and girls soccer teams challenged Wakefield on Wednesday, with results too late for press. The girls face Edison at home this Tuesday, April 21, while the boys’ travel to Edison the following day at 7 p.m.
Tennis: The boys and girls tennis teams return from their hiatus this Thursday, April 16, with matches against Wakefield. Next week pits the teams against Stuart on Monday and Mount Vernon Tuesday. Baseball: The Mustangs carried the day against Stuart last Thursday, winning 13-0. With Wednesday’s game against Rappahannock County canceled, the boys face Manassas Park away this Thursday, April 16, at 7 p.m. Boys Lacrosse: Continuing their success their season – so far, eight wins and one loss – the boys lacrosse team trounced Heritage High 12-6 on Monday night. The boys face Broad Run at home on Thursday at 7:30 p.m. Girls Lacrosse: The Lady Mustangs extended their record to 6-1 with a decisive 18-10 win over Heritage on Monday. Next up, the girls travel to Broad Run Thursday at 7:30 p.m. Boys Soccer: The boys scored a comfortable victory over Rappahannock County Tuesday night, making five goals for the night while leaving Rappahannock’s offense with no goals to show for the evening. Wednesday’s game against Briar Woods was canceled, leaving the boys till next week when they challenge Strasburg at home Tuesday at 7 p.m. Girls Soccer: The girls’ only game this week, against Rappahannock County, was canceled. They face Washington-Lee next Monday in a 7 p.m. away game. Tennis: Due to weather, the boys and girls tennis teams didn’t take on Dominion on the courts Tuesday night, and their Wednesday and Thursday matches against Potomac Falls and Woodbridge respectively were also canceled. They challenge Yorktown this Monday. Baseball: The Statesmen’s Tuesday game against Thomas Jefferson was rained out. They’ll try to capitalize on the momentum gained with their first-place finish at the Loudoun spring break tournament when they face South Lakes on Friday. Boys Lacrosse: The boys lacrosse team ran up against steep competition against South Lakes Monday night, losing 14-6. They’ll go head to head with Washington-Lee tonight. 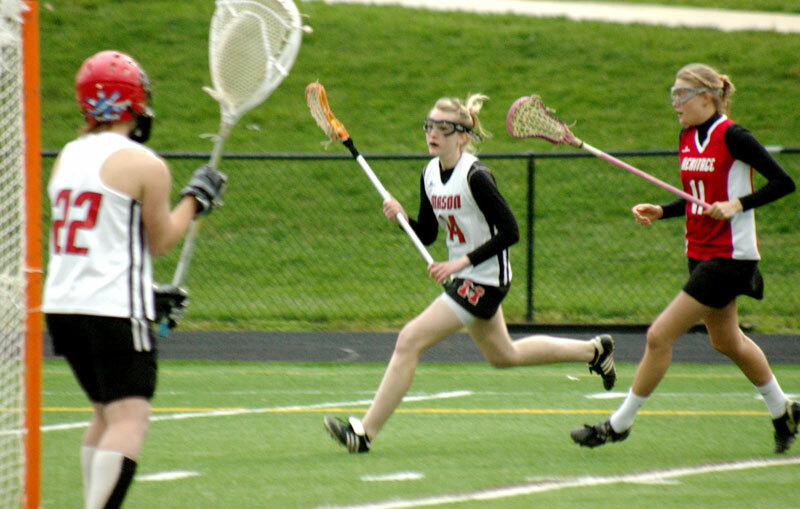 Girls Lacrosse: The girls lacrosse team edged past South Lakes 7-5 on Monday. The girls also face Washington-Lee tonight. Boys Soccer: The boys were shut out by Langley Tuesday night 4-0. The Statesman couldn’t recover from a Langley four-goal assault in the first half. Marshall played better after halftime, but were still unable to put the ball in the net. A key district matchup with Madison is on tap for tomorrow as the team tries to inch their way up in the standings. Girls Soccer: The girls soccer team challenged Langley in a home game Tuesday night, losing 2-1. Next up is Friday’s 7 p.m. away game against Madison High School. Boys Tennis: The boys tennis team fell to Madison 8-1 on Monday. They hope to rebound with upcoming matches against Woodson and Langley. Girls Tennis: The holiday hiatus didn’t affect the girls tennis team. The ladies followed up their improbable win against Thomas Jefferson with a decisive victory over Madison. Sophomore Ana Dominguez, junior Lauren Hopwood, senior Amanda Crider, junior Sarah Doan and junior Kelly Crider came out ahead in singles action. The squad also dominated in doubles play. The teams of Dominguez and Amanda Crider and senior Astrid Adam and Kelly Crider claimed victory. The match moves the girls overall record to a perfect 9-0. Woodson, Langley and Stone Bridge are next up on the schedule. Baseball: Rain washed out Monday’s game versus Woodson. Next on the schedule is a make-up against the Cavaliers, as well as contests with Langley and Stone Bridge. Crew: Both the boys and girls faired well at the Smokey Jacobs Regatta on Saturday. The Girls first 8 blew away the field and the light 8 eight came out 45 seconds ahead of the pack. The boys first 8 also claimed victory. This weekend, the varsity squad travels to the Mercer Lake Sprints. Boys Lacrosse: The Highlanders bounced back from their loss at Potomac with a narrow 8-7 win over Thomas Jefferson. Tonight, they play host to Madison. Girls Lacrosse: The girls also face Madison tonight. They aim to put spring break losses against the Shipley School (Pa.) and the Wilmington Charter School (De.) behind them. Boys Soccer: The Highlanders pulled out a 1-0 victory against Thomas Jefferson on Tuesday to push their record to 5-2. They play at South Lakes tomorrow night. Girls Soccer: The girls’ game against Thomas Jefferson on Tuesday was canceled. The team will be in action against South Lakes on Friday. Boys Tennis: The boys tennis team came out of spring break strong with a 6-3 win over Stone Bridge on Monday. Leading the charge with victories were senior Andrew Cole, freshman Louis Gruber, sophomore Robert Koch and sophomore Charlie Roco. Roco’s 10-1 singles blowout and doubles win earned him team MVP honors for the match. McLean now holds a solid 4-3 record in Liberty District play. The highlanders close out the week with matchups against Madison, Langley and Thomas Jefferson. Girls Tennis: Yesterday’s contest versus Madison was canceled. The team goes up against Langley today and Thomas Jefferson on Friday. Baseball: Tuesday’s game against Falls Church was rained out. Yesterday’s contest with Mount Vernon was also a wash. The Raiders travel to Yorktown on Monday. Crew: The Stuart rowers performed well at the Smokey Jacob Regatta on Saturday. Top finishers included Francis Kinney and Tarek Al-Khulaidy, who finished second in the men’s 2x and Jacob Derzon, Alex Trakowski, Peter Kusmik and Nathan Bent, who placed fourth in men’s first 4 heat B, Sarah Ritter and Abby Voss, who placed second in the women’s 2x. The team will participate in the Darrell Winslow Regatta this Saturday. Boys Lacrosse: The Raiders haven’t seen the field since falling to Falls Church on March 31. They host Edison on Tuesday. Girls Lacrosse: The Lady Raiders fell to Washington-Lee 8-2. They are now 1-7 on the season and travel to Yorktown this afternoon. Boys Soccer: The Raiders have been idle since a 3-0 shutout loss to Washington-Lee on April 2. They face Yorktown tomorrow night. Girls Soccer: Monday’s home match versus Wakefield was canceled. Tomorrow they face Yorktown. Boys Tennis: Weather forced the cancellation of Monday’s match versus Mount Vernon. The boys host Wakefield this afternoon. Girls Tennis: The girls team scheduled bout with Yorktown was canceled and rescheduled for today.